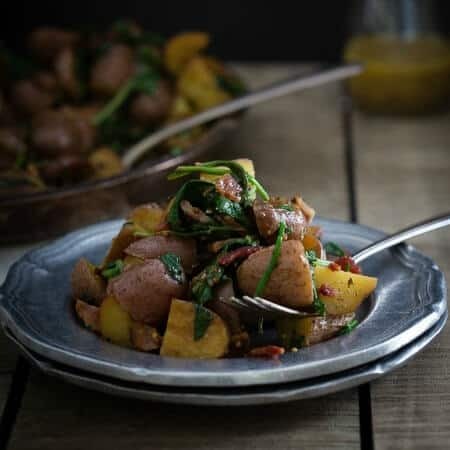 This warm bacon and greens potato salad is tossed with a lemon mustard vinaigrette for a delicious side salad. Way better than those mayo-laden potato salads you’re used to. I’ve literally always hated deli case mayo-laden salads. One glimpse of them at a summer party is enough to make me want to gag (plus, mayo + heat = gross). They’re white, bland, jiggly blobs of nastiness and that doesn’t even touch on the unhealthiness of them. Whether it’s potato, pasta, chicken or tuna salad…it’s all just gross. I’m not even a mayo hater. It has it’s place in this world. That place, however, is definitely NOT as a thick, blubbery salad dressing. Nope, nope, nope. If I’m going to do potato salad it’s 1. going to be warm (cold potatoes are just weird to me) 2. going to have some form of greenery with it (um, it is called a SALAD after all) 3. going to have something way more interesting for a dressing than mayo (like a lemon mustard vinaigrette) and 4. going to have some crumbled bacon going on because potatoes + bacon always and forever. 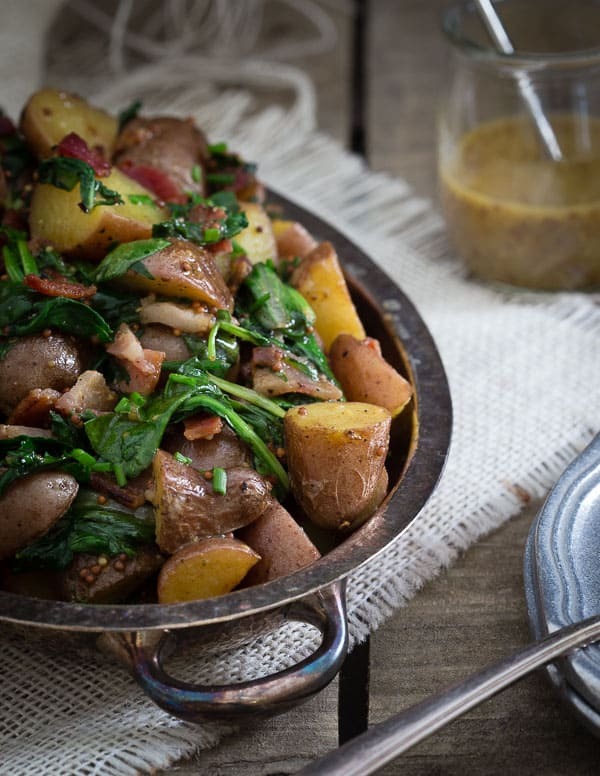 This warm bacon and greens potato salad is tossed with a lemon mustard vinaigrette for a delicious side salad. Way better than those mayo-laden potato salads you're used to. Add the potatoes to a medium pot of cold water. Bring to a boil and continue cooking for about 7 minutes. Meanwhile, cook the bacon in a large skillet over medium-high heat until crispy. Remove and let drain on a paper towel. Strain the potatoes from the water and add them to the skillet with the remaining bacon grease. Season liberally with salt and pepper and let cook for 5 minutes in the skillet, tossing once half way through. While the potatoes cook, make the dressing by combining all the ingredients in a small bowl and whisking together. Turn the heat off the skillet, add the baby greens and toss to combine until they start to wilt. Transfer the potato mixture to a large bowl. Crumble the bacon and add it to the potato mixture along with the chives. Pour the dressing on top and toss until everything is combined and well coated with the dressing. I want this warm bacon salad every day and for every meal. There is nothing better. And mayo salads? Please step aside. You are not needed anymore! This is such a gorgeous salad. I must make this for Easter. Bacon, potatoes and greens are a winning combination. Thanks for the inspiration!!! oh my gawd, Gina. . this looks sooooo good!!! I won’t touch any kind of salad in a deli or at a BBQ with mayo for fear that it’s in the danger zone. Warm mayo is truly a gagging thought. 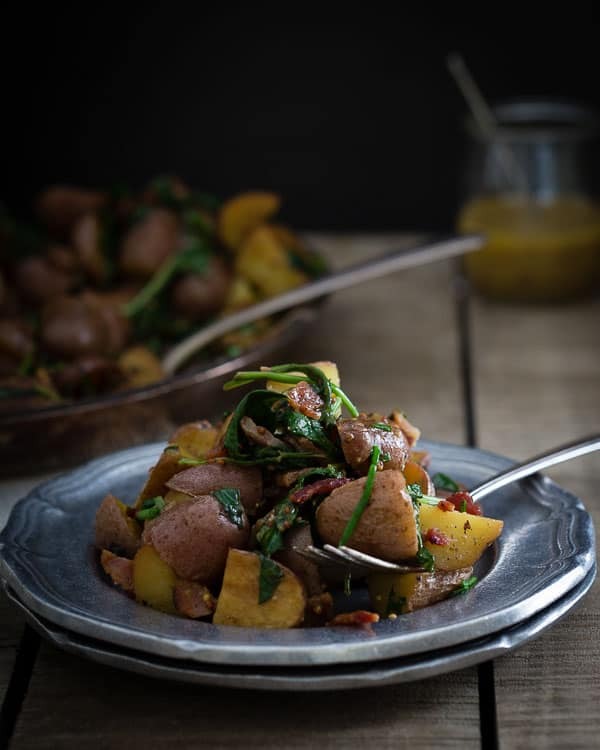 This warm potato salad is how they should all be done, especially since there are greens and bacon in it! While I don’t detest mayo-laden potato salads (can I blame nostalgia?? ), I definitely would go for this if given the choice. And I have to agree bacon + potatoes is always a good choice. Adding potatoes in a salad is something I always try and do- They are probably my favourite ‘ingredient’ – Cheers for this Gina! Bacon and potatoes. They just belong together. This looks awesome! I am definitely not a fan of mayo-laden potato salad. This is one perfect trio. Pinned. I don’t know what it is but I’d always rather have a warm potato salad! And this one looks delish!